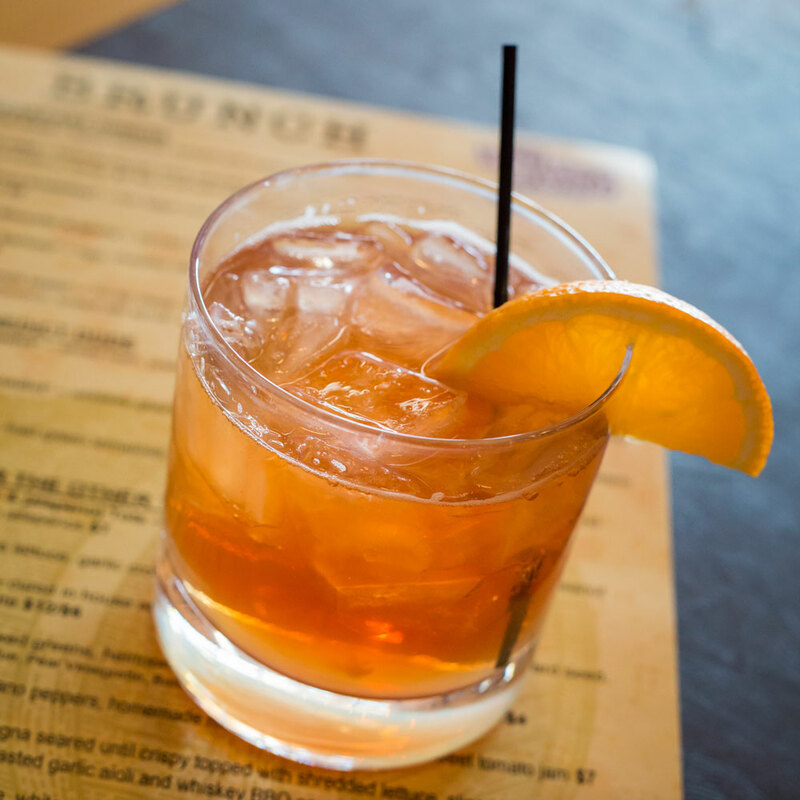 The Whiskey Biscuit in Englewood, CO offers a large selection of whiskeys, wines and craft beers. The ever-evolving drink menu features some of CO's finest spirits and brews, as well as inventive specialty craft cocktails handmade with your taste buds in your mind. Laws Four Grain Bourbon. Muddled amarena cherry, orange slice and a sugar cube. Splashed with soda, stirred and poured over a cube. Bear Creek Rye Whiskey, Cinzano Sweet Vermouth, dash of Angostura bitters. Up or on the rock? Paddy’s Irish Whiskey, bitters, ginger ale with a lemon twist. Woody Creek Rye, Leopold Bros 3 Pins rinse, sweet vermouth, dry vermouth. Served over a big cube. House made bacon-infused bourbon, muddled cherry, maple syrup, Angostura bitters. Stirred over a large cube. A whiskey bacon garnish, of course. Bloody Mary $5 Your choice: Mary with Vodka, Maria with Tequila, Rough Mary with Whiskey. Salted rim and garnished with olive, lil sweetie peppers and a lime. Ask server about adding a pickled egg and pepper mason jar. Same ol’ Mimosa $5 Bubbles and orange juice. Cider Gin Fizz** $9 Woody Creek Gin, lemon juice, Spiced simple syrup, apple cider, egg white. Shaken. Mounds $9 Coffee and chocolate infused vodka, coconut cream, Shaken and served over ice. Fuzzy Mornin’ $7 Deep Eddy Peach Vodka, fresh OJ and bubbles. Mile High Chai $8 Bear Creek Spiced Rum, spiced simple syrup, Iced tea. Shaken and served over ice. Irish Breakfast $7 Kinahans Irish Whiskey, Butterscotch schnapps chased with OJ and a slice of whiskey glazed bacon. Swine Society $12 House made bacon-infused bourbon, muddled cherry, maple syrup, Angostura bitters. Served on a big rock. Garnished with whiskey bacon, of course.